An artist's depiction of a European MetOp weather satellite in orbit. Using a techniqueoriginally developed in the 1960s for understanding the atmospheric propertiesof far-away planets, scientists around the world have been using radio signalsfrom GPS satellites to learn more about the atmosphere of our own planet. That technique, which isknown as radio occultation, was pioneered by NASA's Jet Propulsion Laboratoryand Stanford University. When a planet occults, or passes in front of, a star,the star's brightness decreases. The amount of the decrease can be used to approximatethe height of the planet's atmosphere. When radio waves emitted by the starpass through the planet's atmosphere, they bend and change frequency, and thischange can be measured to determine the atmospheric composition. The GPS radio occultation(GPS-RO) technique works in a similar fashion. The 31 operational GPSsatellites currently orbit at an altitude of 20,000 kilometers above the Earth'ssurface. Satellites with GPS-RO receivers, such as Taiwan's ConstellationObserving System for Meteorology, Ionosphere and Climate (COSMIC)satellites, have a much lower orbit, around 800 kilometers above the Earth'ssurface. As a GPS satellite beginsto set below the horizon of Earth relative to a GPS-RO satellite, the radiowaves it emits pass through the atmosphere on their way to the receiver.Molecules and electrons in the atmosphere cause the radio wave to bend and slowdown, so a wave that has passed through the atmosphere will have a differentfrequency than one that has only traveled to the receiver through space. By measuring the bend andsignal delay relative to the unaffected radio waves, scientists are able to getreadings on atmospheric temperature, humidity, pressure and electron density.The measurements are far more accurate than atmospheric readings taken fromweather balloons or other space-based instruments and provide researchers witha good tool to predict hurricanes, measure climate change and assess spaceweather. 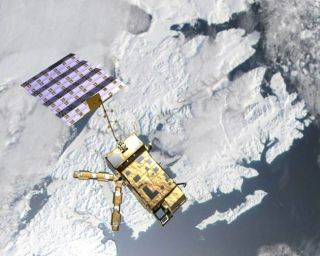 In what is widelyaccepted as a proof-of-concept mission for GPS-RO, the University Corporationfor Atmospheric Research's (UCAR) GPS/Meteorology mission flew a GPS receiveraboard a microsatellite from 1995 to 1997. In 2000, Germany's national geoscience research center, GFZ Potsdam, launched the ChallengingMini-Satellite Payload (CHAMP),which is still operational. CHAMP added the capability of measuring electrondensity in the ionosphere, which is helpful for detecting the space weatherthat causes degradation of satellite and terrestrial communications signals. The Argentinian SAC-Cmission was also launched in 2000, with contributions from the United States, France, Brazil, Italy and Denmark. It provided multi-spectral imagery of terrestrialand coastal environments and studied the Earth's magnetic field and ionosphere.SAC-C's dual antennas enabled it to take twice as many radio occultationmeasurements per orbit as CHAMP because it measured occultations as each GPSsatellite was both rising and setting, relative to the receiving satellite. The most advanced GPS-ROmission, Taiwan's six-satellite, $100 million COSMIC mission, was designed byUCAR and launched in April 2006. The satellites are now producing about 1,200atmospheric profiles each day, about half of what they were designed toprovide, because contact with one of the satellites has been lost andmalfunctioning solar panels are limiting the power to two others. The spacecraft areexpected to perform for two years, but they carry enough fuel to last for fiveyears. System support is being provided by the U.S. National ScienceFoundation, National Oceanic and Atmospheric Association, NASA and the DefenseDepartment. In May, the National Oceanic and Atmospheric Association's National Centers for Environmental Prediction began using COSMIC operationally for its globalweather forecast. The European Organisationfor the Exploitation of Meteorological Satellites launched the most recentradio occultation satellite in October 2006 aboard the Metop-Aenvironmental satellite. It is operationally similar to COSMIC, but providesfewer atmospheric profiles per day as only one satellite is in orbit. Robert Kursinski, anassociate professor of atmospheric sciences at the University of Arizona, believes launching future GPS-RO missions is crucial to understanding climate change.Radio occultation provides temperature readings in the upper troposphere, whereclimate models predict the temperature should be heating up faster than thesurface of Earth. But uncertainty in the temperature measurements of thisregion have been interpreted by some as an indication that the troposphere isnot heating up as fast as the surface, he said. Radio occultation may bethe best method for studying temperature and humidity trends associated withatmospheric climate change because it provides more accurate data than othermethods. Its frequency measurements are time-based, and its satellites arelinked to atomic clocks. Time measurement is known to be the most accuratemeasurable physical quantity. Other instruments used to take atmospheric temperaturereadings may be unreliable for measuring climate change in the long termbecause the instruments' properties can drift over time, Kursinski said. "That's the problemwith a lot of the climate change data to date," he said. "You don'tknow if it's because the atmosphere is warmer or the instrument measurementsare drifting." No country in the worldis currently planning to launch an operational GPS-RO satellite system. The United States' multi-billion dollar National Polar-orbiting Operational EnvironmentalSatellite System was originally supposed to have GPS-RO receivers, but thatplan fell victim to cost reduction efforts, Kursinski said. One company has decidedto take the business of radio occultation satellites into their own hands.GeoOptics, of Pasadena, Calif., aims to launch a constellation of 24 GPS-ROsatellites by 2011, in hopes of expanding to 100 satellites by 2016. The 30-kilogramsatellites will need no control from the ground once on orbit, and will last atleast six years. GeoOptics President TomYunck said the first 24 satellites will cost around $100 million to get intoorbit and an average of $40 million a year to operate and maintain. The companyis in negotiations with NOAA to fund part of the system and will attempt to getinvestment from international government agencies. "With investmentsfrom countries around the world, the amount invested by each could beexceptionally small, while the return in terms of hurricane prediction andclimate measurement will be enormous," Yunck said.